Fresh footage gives us our first glance at the Homeworld Remastered project, which I thought was dead but turns out to have been lurking in a nebula waiting for PAX Australia to start. 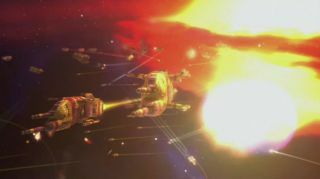 Homeworld Remastered is an attempt to rerelease Relic's brilliant space RTS games for modern audiences. It should be with us in a matter of months, hopefully by February. When THQ folded its various properties were shed, like life capsules fleeing a collapsing mothership. Homeworld ended up in the hands of Gearbox, who don't know anything about making space strategy games, but do know how to add depth of field and some nice lighting to a thing. See the results here. Or, if you'd rather not sit through the video, here are the stills shown during the presentation. They're marred a bit by video compression, but they give us a good look at the new depth of field effects, high-res textures and dynamic lighting. It helps that Homeworld and Homeworld 2 looked absolutely stunning in their original state. If you want to buy the original you have to seek out a physical box with a disk inside. Hopefully Homeworld Remastered will get a digital release, though a physical collector's edition is the only thing available to pre-order right now. Hopefully the code will be similar enough to the original game, and still able to support excellent mods like Homeworld 2 Complex.